We start a new C++ project based on the Third Person Perspective template and name it “InPerson”. Click create project and check the directory where we created the project. Now the Unreal Build tool will have given us a fully working project with a controllable character. That can be moved around in a scene. 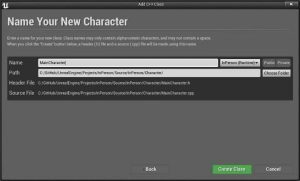 The source code for that character is in C++ and we can open the sln file to look at the code. Just to get a better idea of how things are structured. 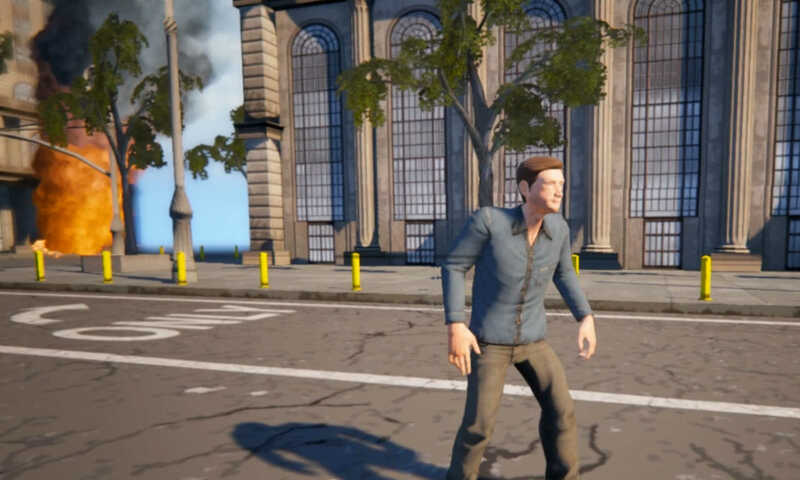 Instead of working on this default character we will create our own from scratch. It should be mentioned that a new project is not strictly needed. New C++ classes can be added to an existing pure Blueprint project. 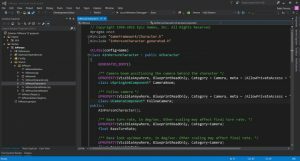 We will not use Visual Studio’s class dialog to add new files to the solution. 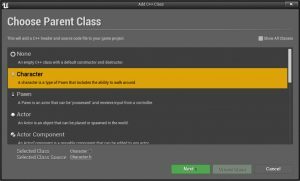 Instead we use the UE4 Editor to create a new C++ classes. 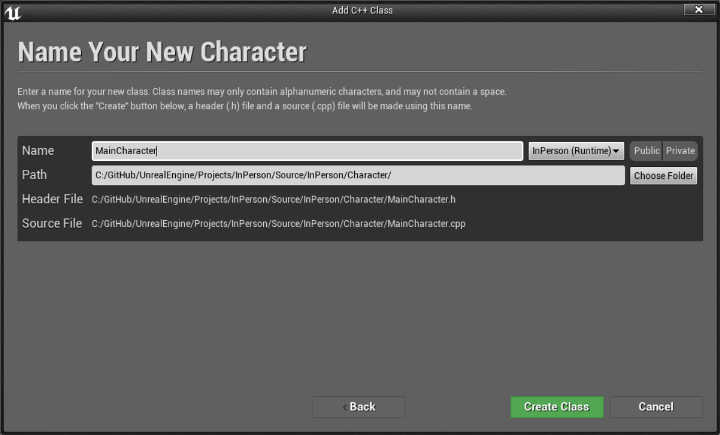 So open the Editor and select File -> New C++ Class. This displays the following dialog. The benefit of using the Editor to create cpp files is that everything gets added properly in the project solution automatically. All classes that derive from AActor must start with the letter A. Therefore since we named our class MainCharacter the actual class name becomes AMainCharacter which derives from ACharacter class. That brings us to line 4 where we include the header for the ACharacter class. This file doesn’t exist anywhere. When the project is compiled the Unreal Build Tool (UBT) will automatically generate it. The key point to remember is that this line must always be the last included header. So for example we will need to include many other headers they must all be above it. Unreal Engine has its own memory management and garbage collection functionality. 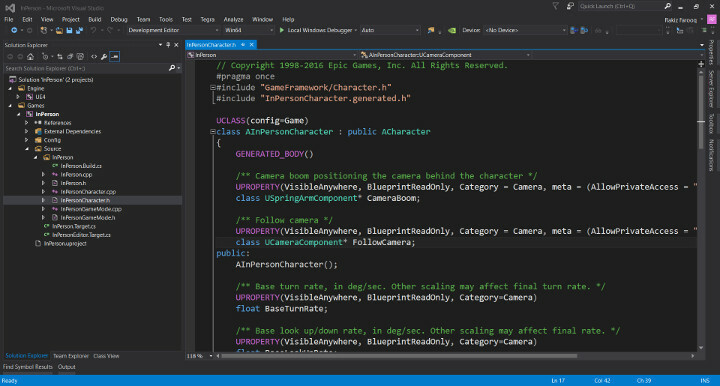 In effect programming in C++ with Unreal Engine is more like working with C# or Java than traditional C++ programming. In fact one can go pretty much through a whole project with ever running into new or delete statements. Notice the UCLASS() macro above the class name and GENERATED_BODY() macro just below. These macros need to be added to any class that derive from UObject. They help the engine keep track of objects. BeginPlay() is called once at the start of play and Tick() is called on every frame. The functions are pretty self explanatory and correspond exactly with the BeginPlay and Tick nodes in Blueprint. 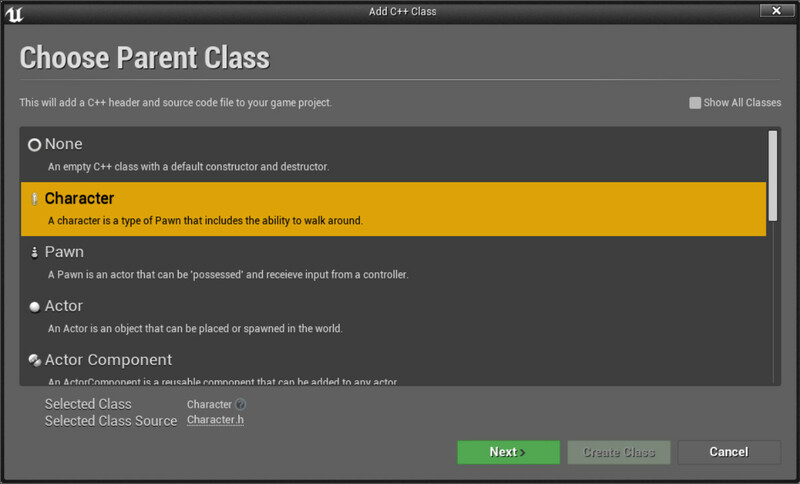 Referencing other assets in the constructor can be problematic because they may or may not yet exist in the game world. All such references can be made in BeginPlay() because it is called after the world is ready. Tick() is where all gameplay calculations and logic is handled on every frame. 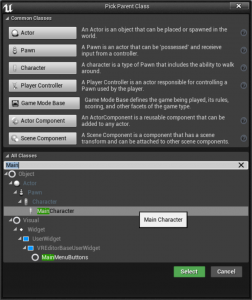 Lastly SetupPlayerInputComponent() is needed to tie mouse, keyboard or controllers to the character so it can respond to user input. The default cpp file is very bare bones but it represents a valid ACharacter class. The project solution can be compiled with no errors. Before we go any further with modifying the character or adding components, let us setup the Blueprint frontend for this C++ class. Open the UE4 Editor and select the folder we want to use. Create a new Blueprint and search for MainCharacter under the ‘All Classes’ dropdown. Doing so creates a new Blueprint, open it and select the Mesh component in the Blueprint. Pick the mesh for this character. The default mesh should be SK_Mannequin. Drag and rotate the mesh so it faces the capsule’s forward vector. Keep in mind existing Blueprints can also be reparented to a C++ class. We do not strictly need to create a new Blueprint. This is precisely what we want. We have a Blueprint with a C++ native backend. We can select any mesh, set and change any default values in the Editor all the while without anything being hardcoded in C++. At the same time all logic and calculations will be done in C++ without any of the overhead of Blueprint. Therefore we maintain both performance and flexibility at the same time. In this article we setup a new C++ project. Decided to create a Character from scratch. Used the editor to create the default source code. Then created a Blueprint and linked it to our native code. Right now the Blueprint doesn’t do much but it is a valid asset that can be dragged into the game scene. 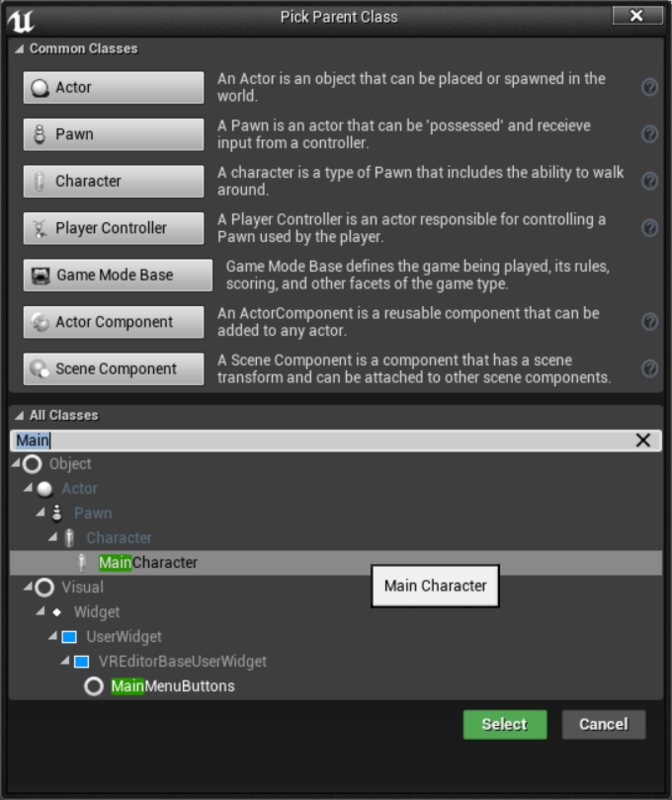 In the next articles of this series we will start adding components and logic to control the character. We will also take a look at animation and getting the character to a game ready state. Subscribe on Social Channels to keep updated.